Thinking about making a charitable donation, or want to bestow your generosity on a loved one? The first thing you have to do is understand the tax implications. Not every charity is created equal when it comes to donations. Some may not qualify to have gifts count as tax write-offs, and some others may not be fulfilling their mission. It's up to you to do the checking to know if your check is getting to the right place for the right purposes. First, check an organization's eligibility status. It's common knowledge that tax deductions can make charitable giving a win-win for donors and recipients. However, a few things have to be taken into consideration before you write a check to any old charity, no matter how deserving you think its cause to be. Not every type of gift is tax-deductible and not every well-meaning organization knows how to put your money to work. "There are scams, there are great nonprofits, and there's a lot in the middle. There's just some that deserve the money more than other," says Lindsay Nichols, spokeswoman for GuideStar. The first thing to determine is if, in fact, the charity of your choice is eligible for tax-deductible gifts. This question is especially pertinent because in June 2011 the Internal Revenue Service revoked the nonprofit status of 275,000 organizations. The mass revocation resulted from a 2006 law that requires nonprofits to file with the IRS for three consecutive years, and many smaller organizations without permanent accountants didn't make the cut. "You may assume you are giving to an organization that has been operating for some time, but they aren't actually a nonprofit and you can't deduct it from your taxes," says Lindsay Nichols, spokeswoman for GuideStar, a nonprofit that promotes transparency in philanthropy. It is important to find out if the philanthropic organization qualifies as a non-profit. One place to check is the Better Business Bureau, or IRS.gov which has information on charities and non-profits. Some people prefer giving to smaller, community-based groups, such as a place of worship. Such gifts are only tax deductible if the check goes to the organization rather than an individual. National Association of Tax Professionals Treasurer Jo Ann Schoen says this comes up a lot when parents donate to a church to fund their child’s missionary work. "If you gave to the fund and the church designates who gets what, you're OK," Schoen says. For any charitable contribution, request a receipt acknowledging the amount and date of the donation. For one-time gifts of $250 or more, the IRS requires that you have a written receipt. All receipts from charitable organizations should verify that the organization is eligible for tax-deductible gifts. The IRS will ask for this receipt if it selects you for an audit. Also, in-kind gifts, such as clothes to Goodwill, must be listed on a per-item basis. 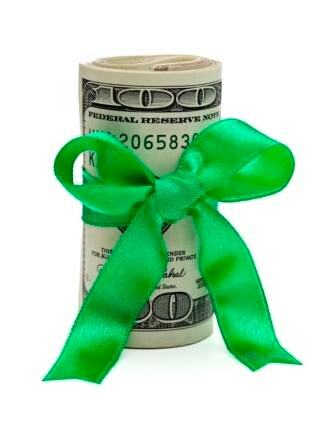 There are special rules covering substantiation for certain non-cash charitable gifts. You may need to report the amount you originally paid for the items if the donation is valued at more than $500. If the value is more than $5,000 a written appraisal may be required. You may be more inclined to dole out gifts to loved ones as opposed to nonprofit groups. These gifts also have tax implications. In fact, you as the giver are taxed on individual gifts of more than $15,000 for tax year 2018. The liability is confined to one-time gifts to and from individuals. That means you and your spouse can both give your child $15,000 per year without worrying about taxes. Unless you plan on giving away millions in your lifetime, you may not have to worry about the gift tax at all. The lifetime gift tax exemption, which is $11.18 million in 2018, shields you from taxes on any size gift up to that lifetime limit. This means you may sign over a $180,000 condo to your child and still have $11,015,000 to give away over your lifetime before worrying about taxes—the first $15,000 is excluded. But it is important to note that any gifts totaling more than $15,000 (for 2018) from you or your spouse to any one person must be reported to the IRS on Form 709, Gift Tax Return, even if the total is within the lifetime limit and you owe no gift tax. There are two other things to remember about the lifetime gift tax exemption. First, a reduction in your exemption will count against your estate tax exemption. Second, the actual exemption is a moving target. GuideStar, a nonprofit that promotes transparency in philanthropy, suggests a five-step process when you donate to a charity, says spokeswoman Lindsay Nichols. Clarify your values and preferences. Think through which types of organizations will connect with you. Focus on the mission. Select organizations with concise, achievable mission statements. Complicated or vague mission statements are recipes for ineffectiveness. Verify legitimacy. Visit irs.gov or guidestar.org to confirm the charity in question may accept taxable donations. Get the facts. Check the organization’s financial statements, which are public records. Check to see if it is making measurable progress on clearly defined goals. Don’t tolerate pressure tactics when seeking information. Professional charities will take "no" for an answer. Trust your instincts. There are 1.8 million charities from which to choose, and many do similar kinds of work. If something about your selection feels wrong, it shouldn’t be hard to find another.